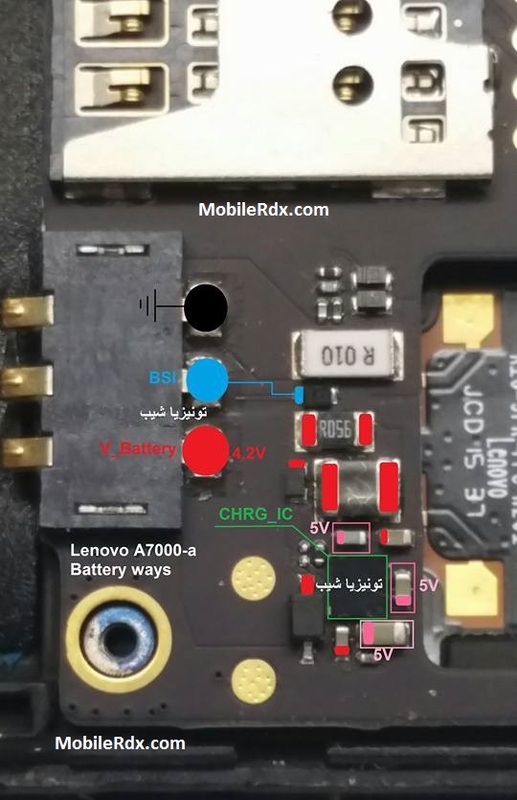 Lenovo A7000 Battery Connector Problem Repairing Solutions are available in the following article.Also you will find Connector Ways and Jumpers information in the diagrams further in this article. If your cell phone is having one of these faults check these diagrams out and do the solutions step by step. If your Lenovo A7000 Battery Connector is damaged somehow by whether mishandling or any other reason you can always replace it with a new one. But if you have damaged the battery Connector prints meaning Connection points on which the the Battery Connector is soldered to the Lenovo A7000 Battery Connector Ways PCBA motherboard no need to worry, Diagrams on the end of this article can help you. If Lenovo A7000 is not getting power ON, Replace the battery and try to power it ON. Plug-in charging pin into jack and try to make it charge. Check batter terminal’s +v and -V points with electronics meter. Disassemble the phone HTC Desire 826 and check battery connectors if these are lose or not fix. Then check the whole motherboard for water and rust damages, Carbon or broken parts.